Long-serving skipper George McMullan has agreed a new one-year contract with Irish Premiership club Cliftonville. It means the midfielder will have a 15th season with the north Belfast club, having scored 100 goals in his 517 appearances. 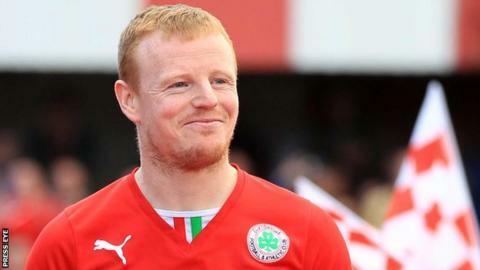 McMullan, 33, is the most decorated player in Cliftonville's history with two Premiership medals, four League Cups and four County Antrim Shields. He is third in club's list of record appearances, 93 behind Mickey Donnelly. Last season Cliftonville's attempt to achieve a third successive league title success fell short, Tommy Breslin's men finishing in fifth place and 21 points behind winners Crusaders. Meanwhile, Glentoran boss Eddie Paterson has ended speculation about his future by signing a one-year extension to his contract. Patterson was understood to be on the brink of quitting his Oval job but the problems between him and the Glens board appear to have be settled in the wake of the club's Irish Cup final triumph. The former Cliftonville manager had one year left on his old contract so is now tied to the east Belfast club until the end of the 2016-17 campaign.